Hosting a lovely weekend brunch can be far simpler than you might think – a menu that works with you and your schedule is key. Recipes that can be prepared in advance mean they’re ready when your guests are. For brunch buffets we love a blend of dishes, from those that can be assembled the night before to quick yet impressive recipes prepared shortly before guests arrive. Whether gathering for an occasion or simply toasting the weekend, there’s something celebratory about a brunch. Special touches like pretty place settings and a beautifully arranged buffet make all the difference. Our brunch recipes are not only simple to plan and prepare, they’re virtually effortless when it comes to creating a stunning presentation. This gorgeous Torte Milanese is an easy make-ahead masterpiece perfectly suited as a main dish and equally lovely as an addition to any brunch buffet. Assorted meats, cheeses, eggs and fragrant herbs are layered between a delicate puff pastry crust. Everything can be prepped ahead of time, even the night before, and then baked the morning of. This is most definitely one of those dishes that will have your guests marveling at your culinary prowess. They say variety is the spice of life and that’s no truer than with this delicious trio of small brunch bites. 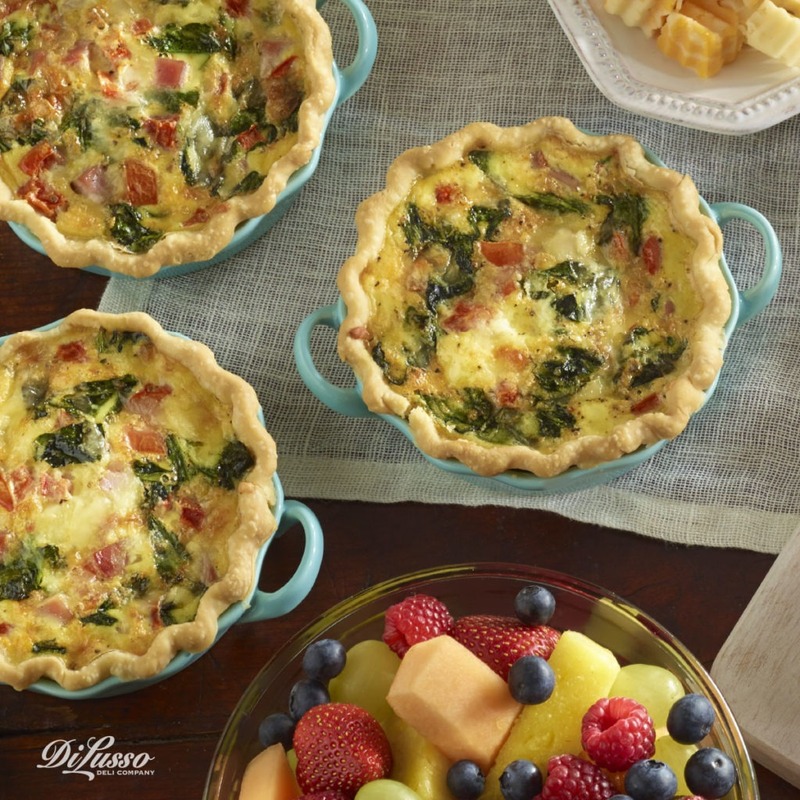 Individual Ham and Cheese Quiches can be served in colorful small baking dishes or sliced into mini wedges for those wanting a taste of everything. 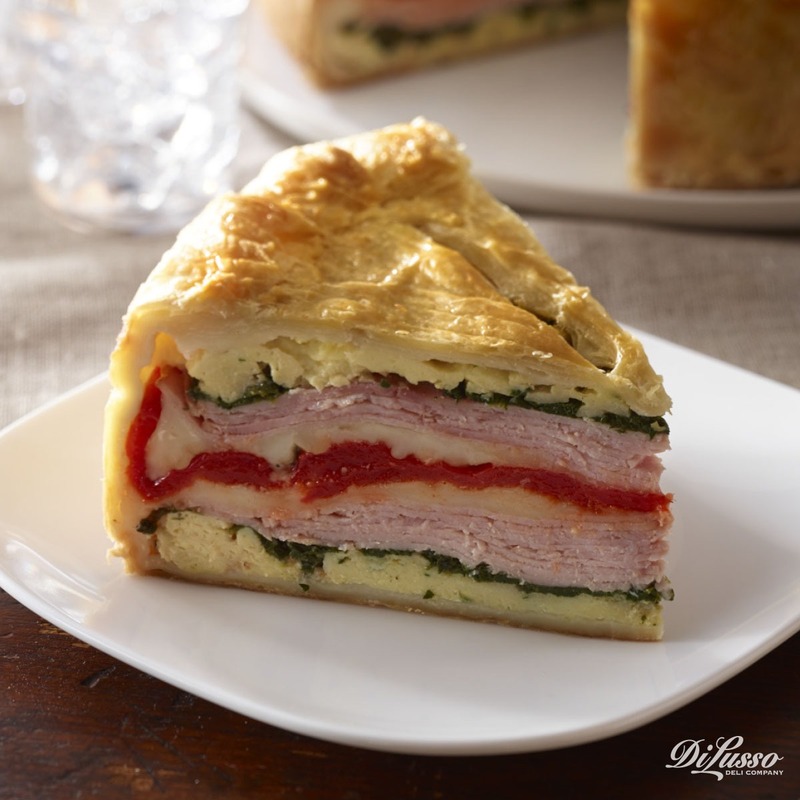 Ours are filled with DI LUSSO® ham and cheeses, fresh spinach and a pinch of cayenne and nutmeg for a uniquely delicious blend of complimentary flavors. Like the torte, they can be easily prepped ahead of time and baked just prior to serving. 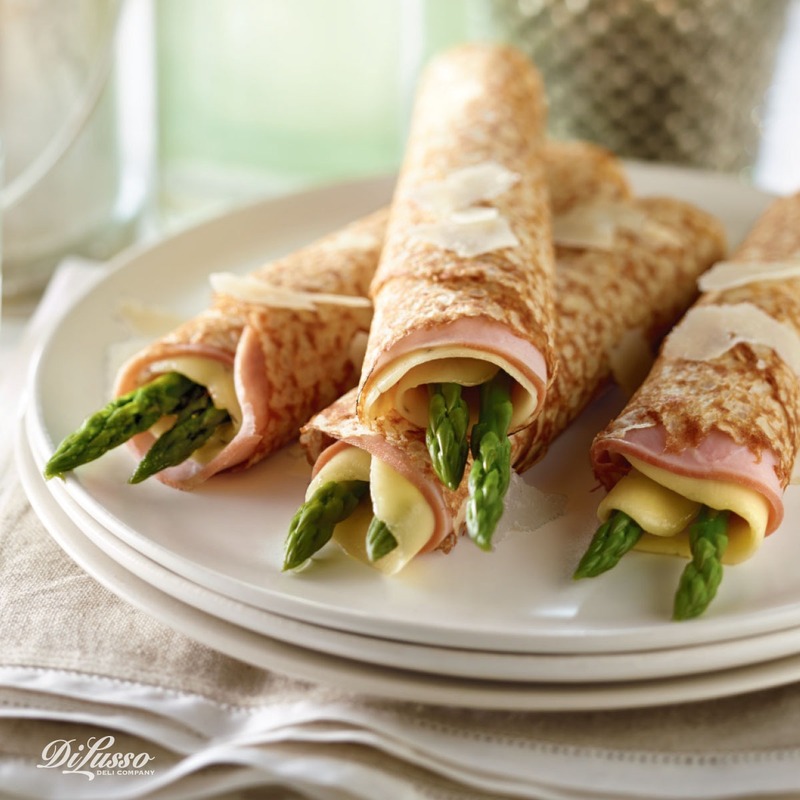 Delectable and delicate Ham and Asparagus Crepes are nearly impossible to resist, especially when filled with our creamy Havarti Herb Cheese. They’re so beautiful arranged on a serving platter and are just the right size for serving buffet style. 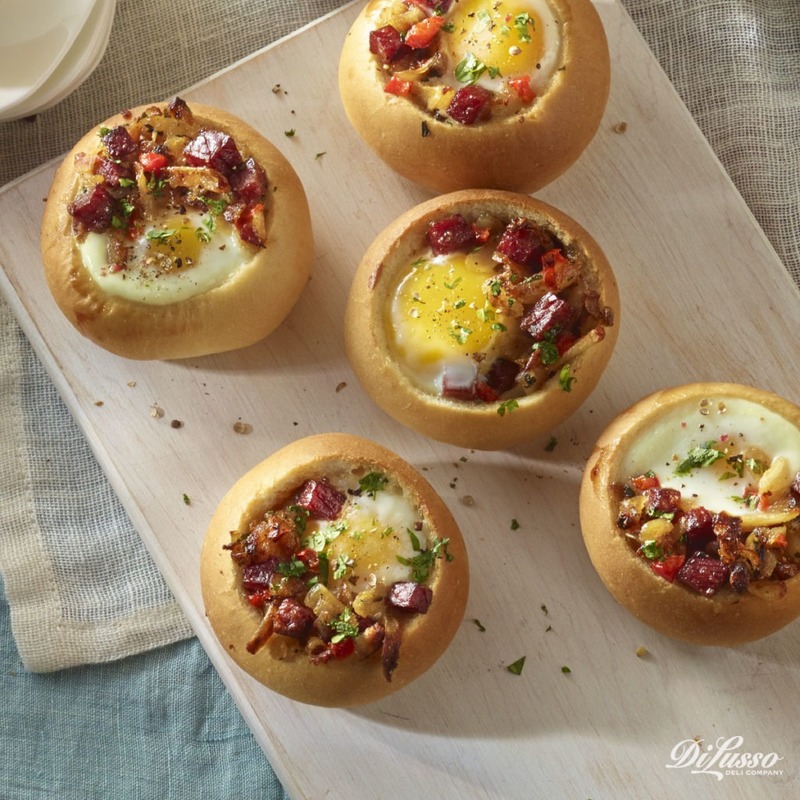 Mini Breakfast Buns are filled with savory DI LUSSO® Corned Beef, a sprinkle of hash browns and topped with a cracked egg. They’re prepared and served in small crusty bread rolls and are so beautiful, it’s hard to believe they take only 15 minutes to prep before baking. In addition to how delicious they are, we love their presentation. Arranging them for serving is virtually effortless. Just line them up in rows on a rectangular tray or in circles on a round platter. Your guests will adore these unique and very tasty additions to your brunch menu. Mimosas! 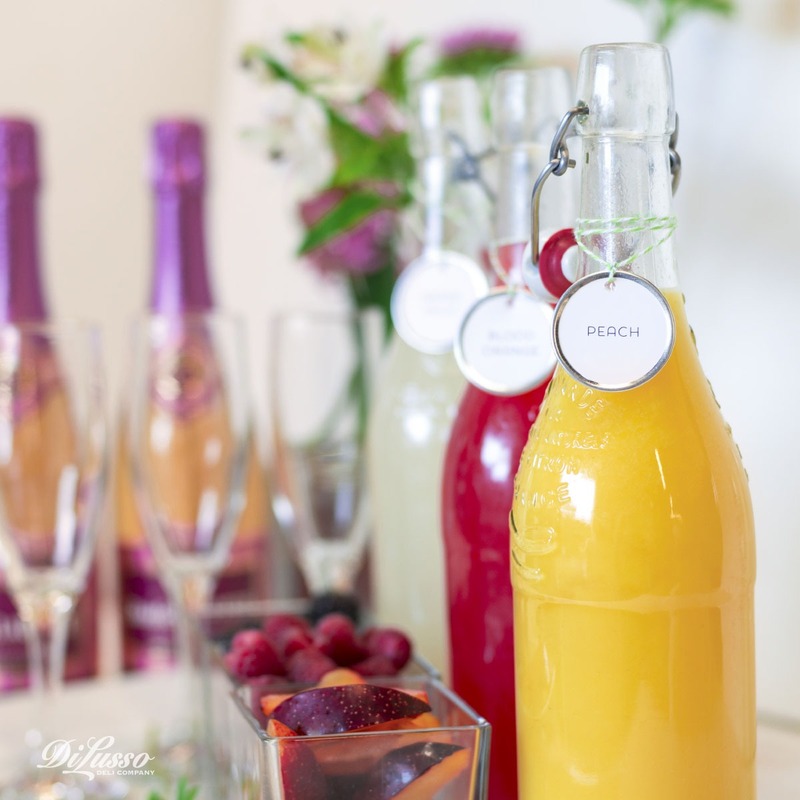 Set out a Mimosa and Bellini bar featuring a variety of fresh juices, fruit garnishes and flutes of champagne. Brunch was never so beautiful, never so delicious. Cheers!